The path to a healthier, happier life begins with self-care. We are here to support you on your journey to wellness. Ms. Genardra Pugh has demonstrated a commitment to academic excellence and professional development. MS. Pugh has a Master’s of Arts (MA) degree in Rehabilitation Counseling from the George Washington University. Additionally, Ms. Pugh obtained a Bachelor of Arts (BA) degree in Psychology from Spelman College. 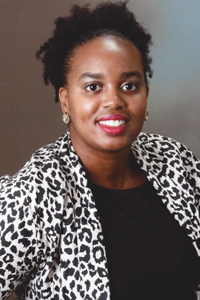 Genardra has a variety of clinical experience, in addition to her work at Friends in Transition (FIT), she is currently a Rehabilitation Counselor with the State of Maryland where she provides services to transition aged youth and young adults with multiple disabilities. Genardra also received training at the Community Counseling Services Center at GWU and at Jackson Field Homes Behavior Health Services. Ms. Pugh has also received training and is certified to administer Mental Health First Aid. Genardra believes that counseling serves as an outlet for people to self-express and gain self -awareness without judgment. Genardra’s approach to counseling is to build rapport with clients and understand their world while acting as a facilitator of change through the therapeutic relationship. Genardra aims to create a safe place where clients are able to be vulnerable and courageous in meeting their individual goals. You find yourself stuck and you want to move FORWARD in your life…I am here to assist. I work with clients who are interested in creating change in their personal lives, careers and relationships. Needing to revamp your resume, but aren’t sure where to start? Needing assistance to prepare for a job interview? You are a current college student and are struggling academically and/or emotionally? You are experiencing depression or anxiety and would like to find more effective coping strategies? You are in a relationship that has you feeling icky and devalued. Déjà vu? I enjoy working with young and middle age adults who are ready for a CHANGE in their life. Whether that be a new job, career, recovering from a relationship or restoring a current one. I work with clients to uncover their interests, desires and values so that they can create their ideal life. I use a variety of tools and assessments to help clients achieve their goals. I have worked as a Rehabilitation Counselor for the past 4 years and am in the process of re-certifying as a Licensed Professional Counselor under the supervision of Dr. Ajita M. Robinson. As a clinician, my job is to assist you in facilitating change and to help you with finding and developing your voice and decisions. My job is also to encourage, empower, and facilitate awareness and education. You may be experiencing issues such as: career and professional development, issues with self-esteem and self-worth, adjusting to new situations and relationships.